During your holiday, take the Chemin des Pandas (the ‘Panda trail’), which links the centre of the campsite to the “PandAventure Park” leisure park, a safe path set aside for pedestrians and bikes. You will discover an indoor leisure park which appeals to children and adults alike! This 1,000 m2 playground, magnificently decorated with the treasure island theme, will ensure you spend enchanting and magical times as a family or with friends. The giant rock-climbing tower enables them to discover a magnificent viewpoint over the island, arriving at the top and going back down by the gigantic spiral slide! The most foolhardy will play pirates by using cannon balls, or having a go at treetop adventure. The very young also have a space set aside for them with games which will develop their motor skills and their curiosity (for example a children’s playhouse, a mini-slide and others...). PandAventure Park is a family leisure park. Everything has been thought of, so that your family holiday is unforgettable. We have created a separate area including games for teenagers and adults. You will find driving simulators and virtual reality games there. Strapped in and equipped with VR glasses, you will discover incredible worlds and experience amazing sensations. The VR room is accessible to those with a height of at least 1.4 metres. There are dozens of games available for you (exploration and adventure games, combat games, skills games...). You are able to play as a single player or 2 players in the same world. 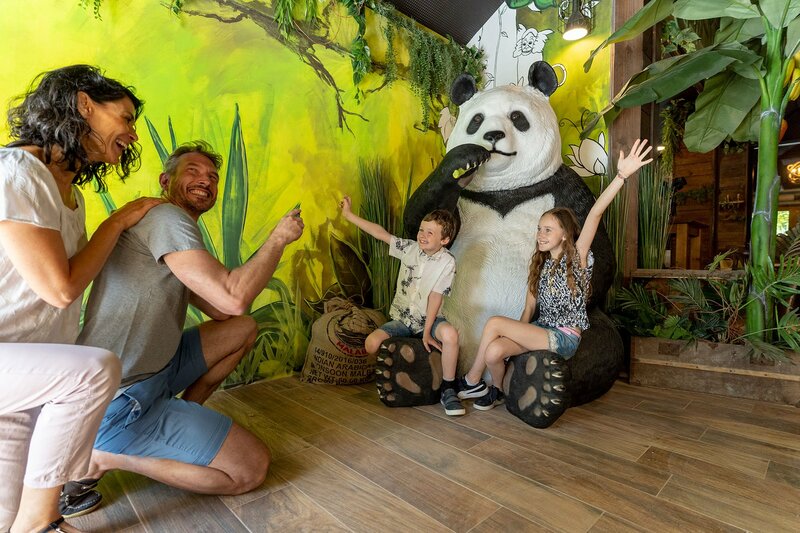 The PandAventure Park - a unique location to celebrate your birthday! If during your stay at the Le Letty campsite, you wish to organise your child's birthday, this is entirely possible! Discover our formulas adapted to your needs including entire facilities available from morning 'til night, with a meal or a birthday tea party. What better way to blow out your candles than meeting up in a magical setting, surrounded by your tribe. Discover this unique world which has many surprises in store just for you. Admission to the park is free for adults (from aged 18 years and upwards). Adults not accompanying minors will not be let into the park. For the entire duration of your stay on the Le Letty campsite, your children can freely access, with the number of entries unlimited*, the Pandaventure Park leisure park for only €8/day per child from aged 3 to 17, and €4/day per child from aged 1 to 2. You must pay to use coin-operated games (here operated with tokens). - Secure path to take you to the PandAventure Park located at the entrance to the Le Letty campsite. - Within the park, children are the responsibility of their accompanying adults. - Wearing socks is compulsory even for adults. - Picnics and rucksacks are forbidden. The restaurant “L'Arbre au Trésor” offers you a varied menu for your meals and French afternoon teas. - For safety reasons, adults not accompanying children are not permitted in the leisure park. - Animals are not permitted in the leisure park, or within the restaurant “L'Arbre au Trésor”. After leaving the leisure park you cannot return without paying the entry fee again. Entry to certain games requires payment of an extra charge. Campers and campers’ visitors enjoy preferential prices over the general public: a 20% reduction on the prices for “Unlimited access for those aged 1 to 2” and “Unlimited access for those aged 3 to 17”.